1920×1080 vs 2560×1440 – Which One Should I Choose? The higher the resolution the better – if you can afford it. 2560×1440 in comparison to 1920×1080 provides you with more vivid details and more screen real estate but it’s also more power-hungry when it comes to gaming. If your PC rig is too strong for 1080p, you should definitely invest in a 1440p or higher display. 1920×1080 or Full HD is still considered as the standard resolution since most of the content out here is in 1080p. Moreover, it’s not very demanding and nowadays, 1080p displays are quite affordable. However, many users are not happy with the image quality. So, what exactly will 1440p offer you as opposed to 1080p, at what cost, and is worth it? Let’s find out. 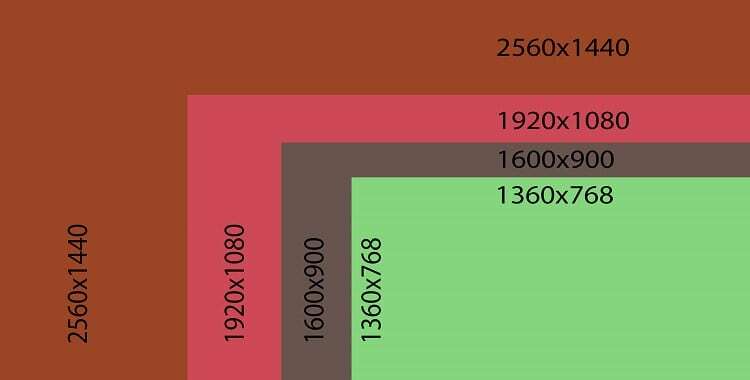 1920×1080 amouts to 2,073,600 pixels while 2560×1440 or WQHD has 3,686,400 – that’s 78% more pixels. Both resolutions have 16:9 aspect ratio. 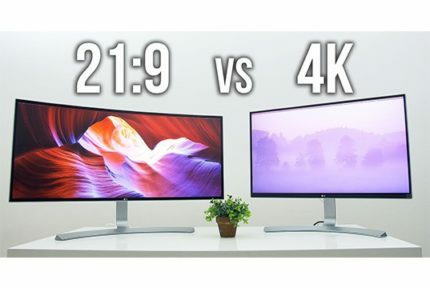 The best way to illustrate the difference between the two resolutions is by comparing how they look on the same-sized display, let’s say a 27-inch monitor. 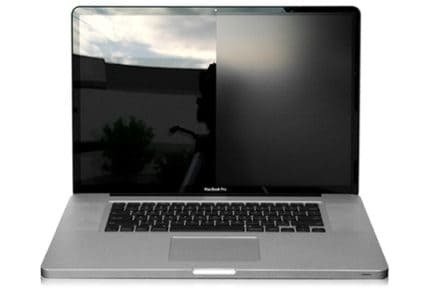 This is where pixel density plays the key role. On a 27-inch monitor, the 1080p resolution offers roughly 81 PPI (Pixels Per Inch) while 1440p provides around 108 PPI. Essentially, this means that the picture on a 27-inch 1080p monitor will be pixelated, have smudgy text, and blurry details. That’s why we don’t recommend getting a monitor larger than 24-inches for Full HD resolution. With 108 PPI, on the other hand, you hit the sweet spot between image detail and screen real estate, in turn, getting plenty of room to view your spreadsheets and applications with no picture quality penalty. As such, the 4K resolution on a 27-inch monitor has ~163 PPI giving you even more details and space, but in this case, you’d need to scale your interface in order for small items to become easily readable. The 2560×1440 resolution on a 27-inch monitor allows you to have two browsers open next to each other and comfortably view content from both without anything overlapping. This makes 1440p monitors ideal for multi-tasking and professional purposes, especially if you can get two for a dual setup. Another thing that you should have in mind is the resolution of the content you’ll be watching. When watching Full HD 1080p content on a 1440p monitor, a video player uses upscaling (or upconversion) process which matches the number of pixels in order to deliver the full-screen viewing experience. While this decreases the quality of the image, it’s not always particularly noticeable as the bitrate of the video also plays a role in it. For instance, the 1080p Blu-ray movies look fantastic on 1440p resolution displays, while some lesser quality videos are not as sharp – but still watchable. While gaming is very demanding at 1440p, everyday use is not. As long as you’re just doing basic stuff on your computer such as web-surfing you will be fine even with a good integrated graphics or any sub-$100 dedicated graphics card. The most important thing to consider when choosing between a 1080p or a 1440p monitor for gaming is the hardware requirements for a certain video game and the desired picture settings/FPS (Frames Per Second) rate. To maintain steady 60 FPS at WQHD resolution and high settings in the latest titles, you will need either an NVIDIA GTX 1070 or an AMD Vega 56. 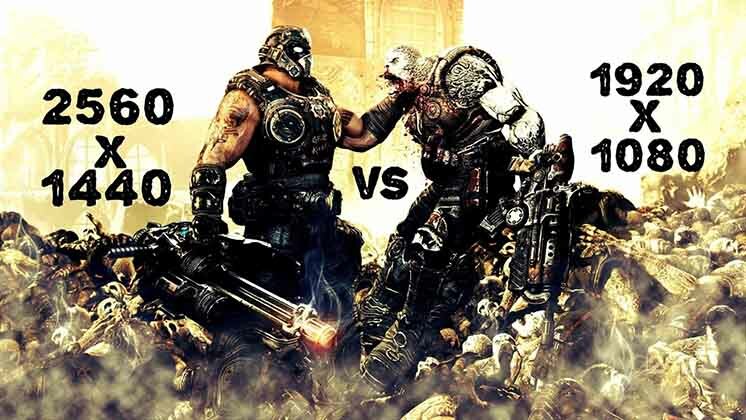 Running video games at 1080p and 60 FPS with high settings is doable by more affordable graphics cards such as an AMD RX 560-4GB or an NVIDIA GTX 1050 Ti. In the end, it all comes down to your personal preference, your PC gear, and the available budget. Keep in mind that with the GTX 1070, you could also opt for a 1080p 144Hz monitor instead, if you mainly play fast-paced competitive FPS games. Ideally, you can get a 1440p 144Hz monitor though you will need a GTX 1080/1080 Ti/Vega 64 for that – depending on what games you play and at what graphics settings. As you can see, there are many things to take into account when it comes to 1080p vs 1440p. For everyday use, there aren’t as many factors to consider apart from the monitor price and size. When it comes to gaming, you will have to choose between the gameplay fluidity and better graphics unless you can afford a more expensive display/PC setup.